This post was originally published on June 2, 2011. 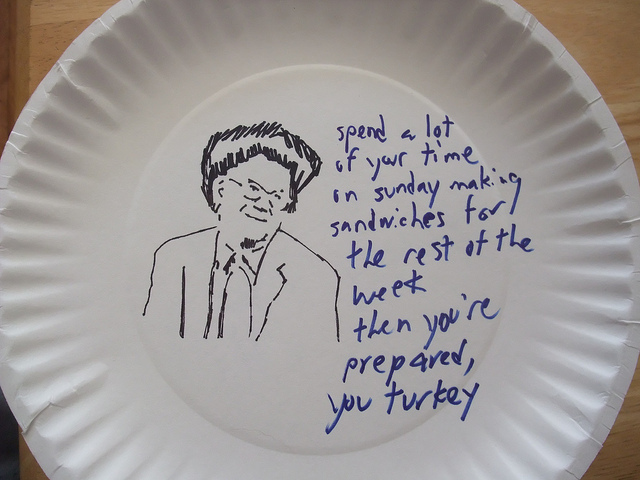 Dr. Steve Brule plate by James Allenspach. In a fast and testimony meeting several months ago, a woman we didn't recognize stood up from the second row (in the benches, not at the pulpit) and began to bear (what we thought would be) her testimony. It started off a little oddly but mentioned the Joseph Smith story, so we thought it was going somewhere. It was not. She started to drift off into talking about computers and binary code, as well as some plates that had been revealed to her. Uh-oh. As a visual aid she held up some of the plates, which turned out to be 8-inch paper plates, with some handmade designs on them. We later found out (I am not making this up) that the designs were made in vanilla yogurt. After ten very nervous minutes, the Bishop leaned over to me (his counselor at the time) and said "Old buddy old pal, could you please go down and let this good sister know that there are several other people that would also like to bear their testimonies?" So I got up, went down into the congregation, and sat in the row in front of her trying to catch her eye. She wasn't having any of that. She was well into reading from a binder she had brought, which contained some type of lecture I didn't really understand, but included a recitation of the English alphabet and the subsequent pronunciation of each letter in Spanish. I finally stood up next to her and whispered the bishop's instructions, to which she replied "just a minute" while having me “talk to the hand.” Trying my best not to say, “Oh no you di-int!” I replied, "please wrap it up in the next minute or so" and sat back down. To my great surprise, she did and I went back up on the stand. The bishop then spent literally the entirety of Sunday School talking with the sister trying to make sure she hadn’t been offended (she hadn’t been). After the meeting, I probably had 15-20 people come up to me and tell me “how well [I] handled that.” Though I appreciated the sentiment, I’m not sure what other course of action there was, but okay. What I liked best was that everyone wanted to share their own “I can’t believe that just happened in sacrament meeting” story. I’d love to hear yours if you care to share. Maybe my wife will share the story about a woman she heard about who got up and bore her testimony that “I’ve been having impure thoughts about Brother [insert name of a married brother who was in the congregation at the time].” Um… wow. Definitely worse than yogurt plates.